Well, thanks to io9, for sending a boatload of traffic to this site to read Hayao Miyazaki's 1980 Mononoke Hime book. Now that I've got your attention - well, the few of you who chose to stick around - I'd like to show you something you may have noticed. First, the quick backstory on Mononoke. In 1980, Miyazaki published a book of image boards he drew for a story project that never got off the ground. Titled Mononoke Hime, it told the story of a giant cat, named Mononoke, who kidnaps a girl and demands that she become his wife. The girl's father is possessed by the spirit of a demon who turns him into a bloodthirsty warrior and a brutal tyrant. She convinces Mononoke to take her home and save her father. By the end of the story, the girl discovers that Mononoke was actually a young boy who was wild and greedy. He behaved like an animal and was cursed to live like one - echoes of Beauty and the Beast. This unfinished Mononoke Hime bears no real relation to Studio Ghibli's 1997 movie of the same name (the title was Toshio Suzuki's idea). 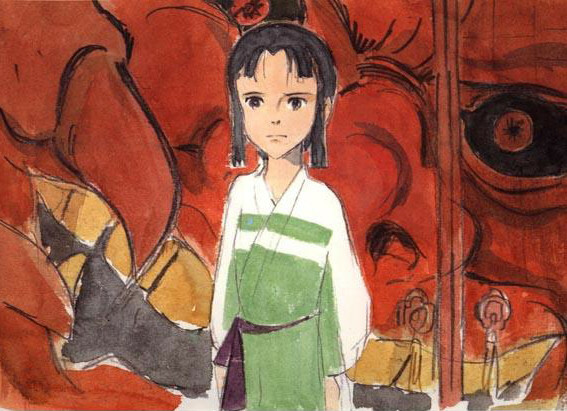 But the story's climactic sequence is echoed again, interestingly, in 2001's The Spiriting Away of Sen and Chihiro. 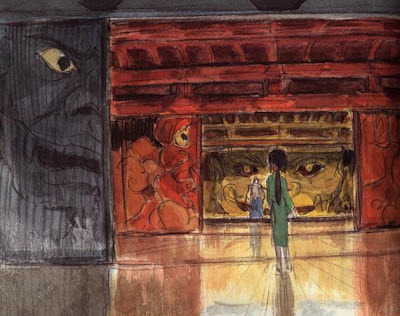 I'll assume that you've seen Spirited Away a few times, so you'll spot these shots right away. In this scene, the unnamed girl confronts her father in his castle. 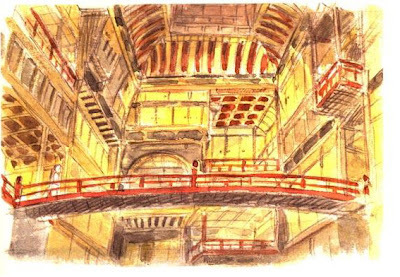 Notice the patterns on the walls, which is a useful bit of foreshadowing as well as an impressive piece of Japanese art. Alone in the chamber, she succeeds in freeing her father from the demon, who then inhabits a suit of samurai armor. 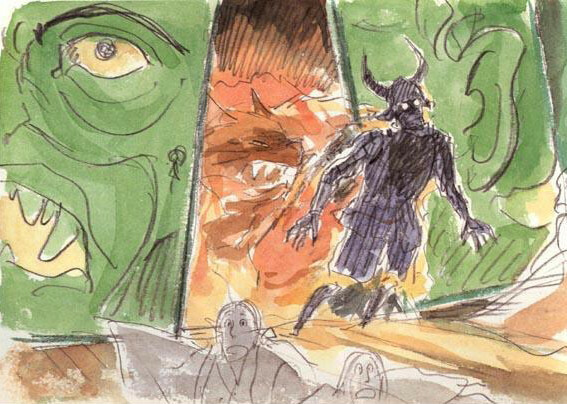 Mononoke (that's the giant Totoro-ish cat) rushes in to block a wall of flame, and charges out of the room and down the hallway at the monster. This just also happens to be one of my favorite scenes in Spirited Away. It's the sequence where Sen confronts the bloated and greedy No-Face creature. Sen offers something which begins a chain reaction, causing No-Face to regurgitate and bellow and smash down the hallways in a violent rage. It's a smashing bit of directing, perfectly tense, masterfully timed, and climaxes in an explosive rush. It's one of my favorite Miyazaki action scenes. Take a look at these Mononoke Hime image boards and see for yourself. Wow, great research on Miyazaki's old concepts. Thanks! I can see echoes in Cat's Return too. Weird.